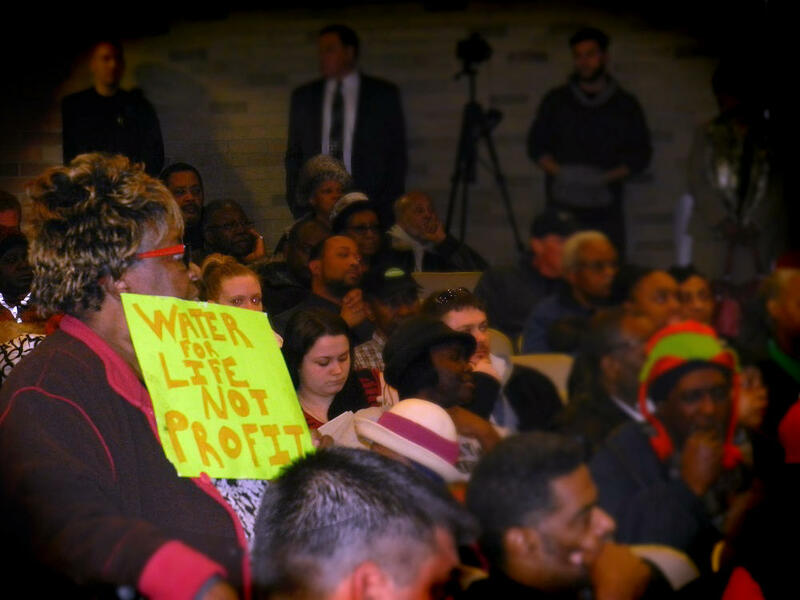 A Flint water meeting in January 2015. 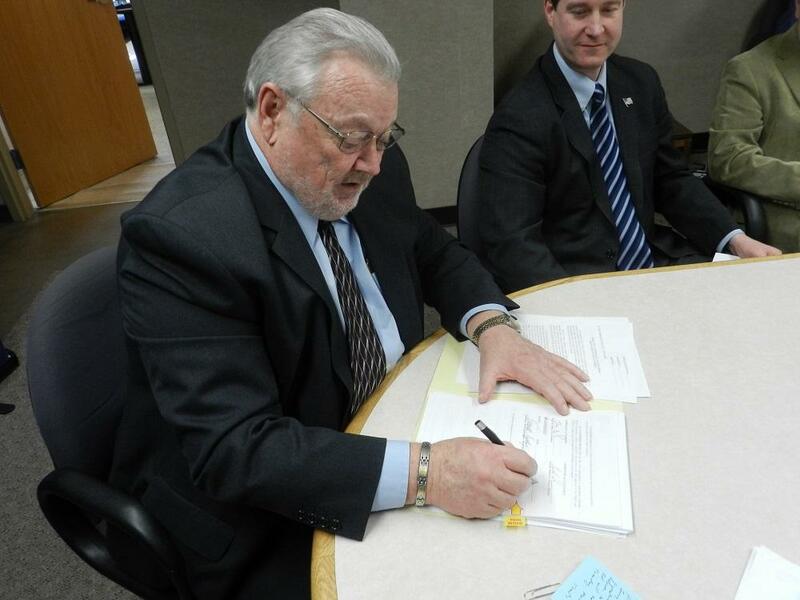 Flint's then-emergency manager, Ed Kurtz, signs an agreement to join the Karegnondi Water Authority. Flint had a string of these state-appointed financial hatchetmen during this time -- trying to get the city’s finances straight. That brings us to April 25, 2014. It was a Friday morning. 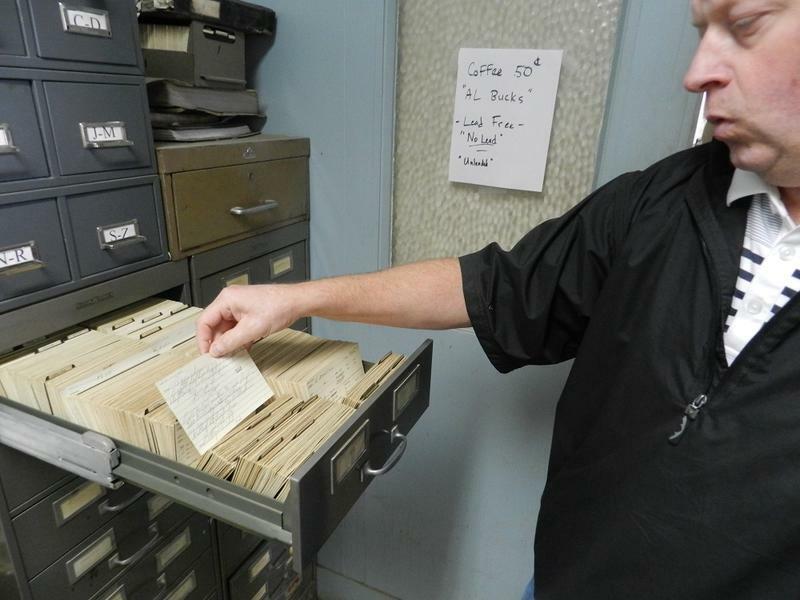 A small group of city and state officials got together inside the Flint water plant. It was a big day. The day Flint stopped buying Detroit’s water. 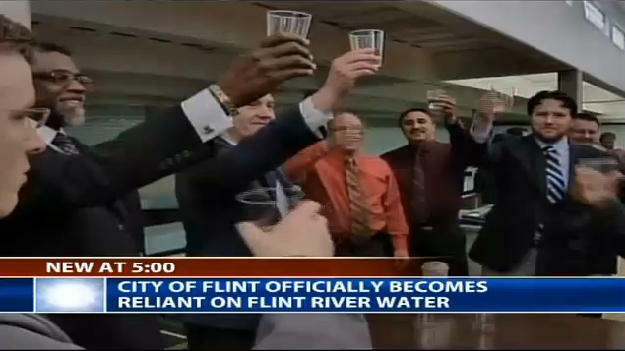 Flint officials toast each other as they flip the switch to the Flint River. There was a countdown, and then Flint Mayor Dayne Walling pushed a tiny black button. That push of a button closed a valve in an underground pipe that brought water from Detroit. Flint was officially cut off from Detroit’s water. To celebrate, the group took small clear plastic cups, and filled them with the city’s new drinking water. In TV station WNEM’s report from that day, you can see the group come together in a small circle. They raise their plastic cups, smile, and make a toast. But the celebrations didn’t last long. City residents started complaining right away. The water was brown or reddish. Darnell Earley was Flint’s emergency manager at the time of the switch. “What we have to do is respond to that, find a way to fix it, make it better and move on,” said Earley. Things did not get better. Four months after the switch, the city detected E. coli in the water. E. coli is a nasty bacterium. It can make you very sick, and it can even cause kidney failure in kids and the elderly. Residents were told to boil their water. These boil water advisories came out right around the time kids were heading back to school. Phylis Brock is a lunch lady at Flint Community Schools. She says there was one little girl who would come into the cafeteria in the mornings, and she was really concerned about the water Brock was using to make her oatmeal. The little girl’s mom told her to be careful. “’So I had to go back and forth with her for about three days. ‘It’s bottled water’ – ‘Yes, I boil it’ – ‘Mom said no’ – and so finally I’ve convinced her. She’ll eat oatmeal again,” said Brock. Brock’s boss, the executive chef at Flint Community Schools, Wally Janeczek, said there were other problems. “Some of our cooks started mentioning about how the water was smelling and that when they turned it on, it didn’t look quite right,” he said. Janeczek didn’t take any chances. Five months after the switch, he started buying gallons of bottled water in bulk to prepare and wash all of the school food. Janeczek’s main concern was the E. coli. You can’t make food for a school full of kids laced with bacteria that can make you violently ill. And Flint did get a handle on the E. coli problem, but killing the bacteria brought a whole new set of problems. The city started dumping chlorine into the water system. Now people complained the water smelled like a swimming pool. Flint resident Amber Hasan says the smell wasn’t the scary part. "My eyes are burning in the shower and I was like, 'oh my goodness, like, what's going on?'" “My eyes are burning in the shower and I was like, ‘oh my goodness, like, what’s going on?’ I get out the shower and I can’t see for a minute because my eyes are burning from whatever,” said Hasan. Meanwhile, six miles south of Hasan’s house, Lee Anne Walters started noticing alarming clumps of hair in her shower drain. If you’re thinking these people are delicate flowers with sensitive skin and eyes, consider this: Flint’s water was so caustic; it was damaging car parts at one of General Motors’ engine plants. 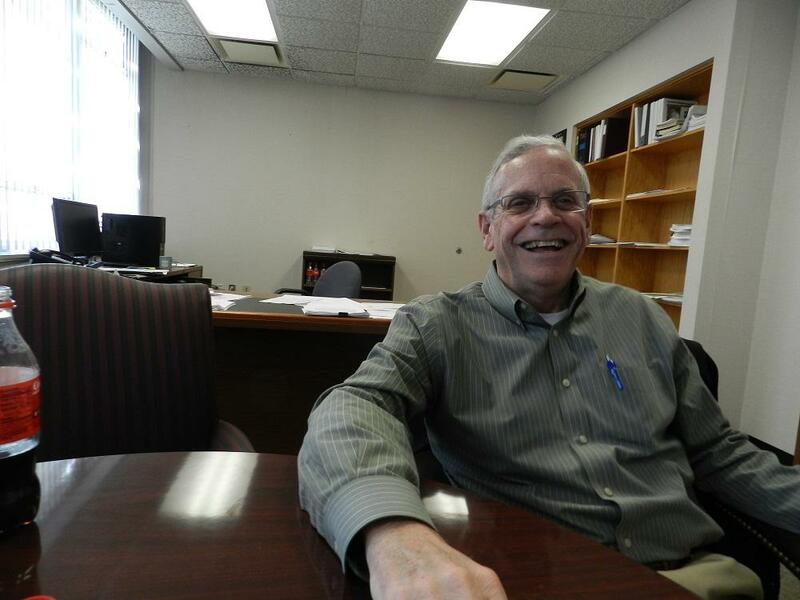 Tom Wickham is a spokesman for GM’s Flint operations. Worker at the Flint Engine plant. “So what happened was we had employees who were checking the parts and they noticed there’s something wrong here. There was some corrosion, some rust forming and they decided to raise the red flag,” says Wickham. GM tried to treat the water to get rid of the extra chlorine that Wickham says was rusting the engine parts. It didn’t work well, so they brought in semi-trucks full of water instead. But GM was kind of lucky. A sliver of the company’s sprawling property is technically in Flint Township, not the city of Flint, and Flint Township still gets its water from Detroit. 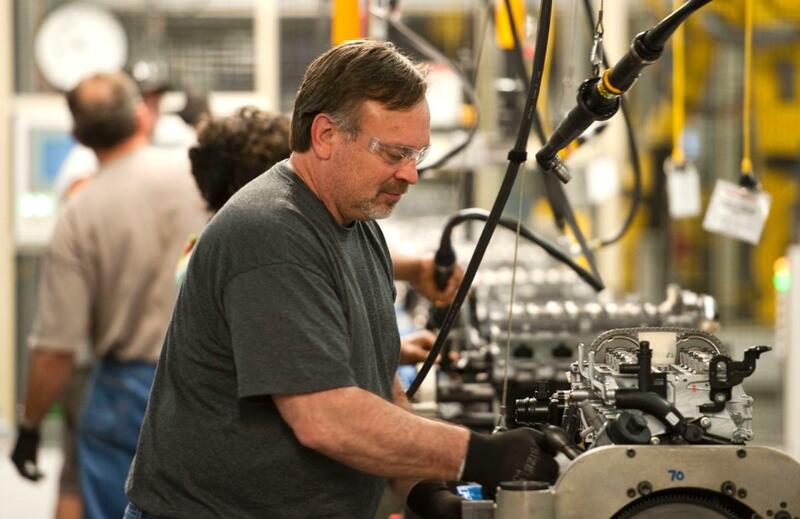 GM discovered it could hook up through the township and get its water from Detroit again. So eight months after the switch, GM left Flint’s water system. The company was one of Flint’s largest water customers. GM pulling out meant the city lost almost half a million dollars a year. And then, a month later – nine months after the switch – people living in Flint got a notice in the mail. 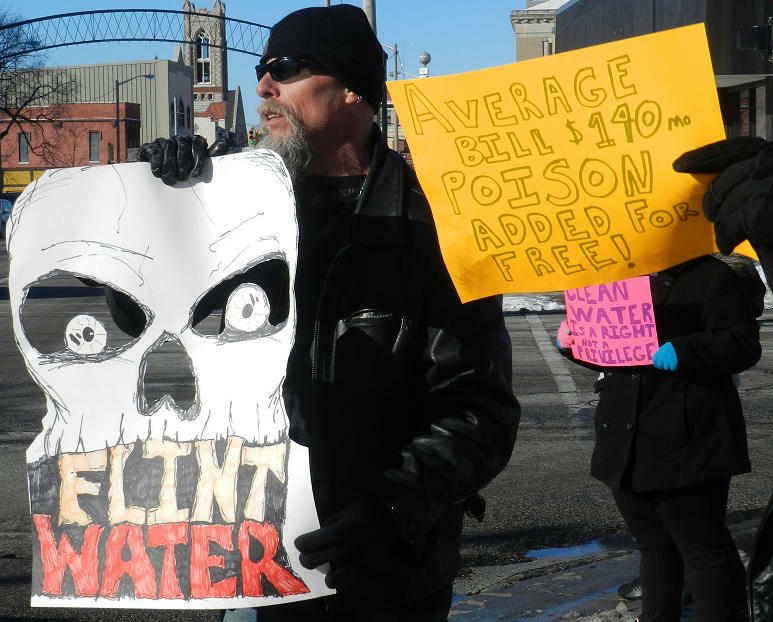 The notice said Flint was in violation of the Federal Safe Drinking Water Act. It turns out: the city dumped too much chlorine in the water, so much that a by-product of the disinfectant, called trihalomethane, was above levels set by the federal government. Over time, exposure to trihalomethane can increase the risk of cancer and other health problems. It’s no surprise that angry people showed up again in droves at city hall, but their concerns were pretty much blown off. Walling is a former mayor now, thanks to the water crisis. By this time, people were bypassing city hall – which wasn’t offering much help, or even acknowledging the problem. In January 2015, in single-digit cold, people like Mike Sargent took matters into their own hands. They started giving out cases of free bottled water. Sargent spent the morning loading them into people’s cars and trucks. “You know, I knew that our intention would only be a band-aid on all that needed help,” says Sargent. Yet another emergency manager in Flint, Jerry Ambrose. By this time, Flint had a new emergency manager. Jerry Ambrose insisted the water was safe. In fact, Ambrose seemed more concerned about bad press than bad water. At city hall, residents like Claire McClinton demanded the city reverse course. But Ambrose was blunt: The city was broke. It couldn’t afford to reconnect to Detroit, even if it wanted to. Through that spring of 2015 and into the summer, folks hauled their milk jugs full of discolored water to meetings. They brought their hand-lettered signs down to city hall. Good Samaritans handed out bottled water. But the “Flint water crisis” hadn’t been coined as a phrase yet. Out-of-town reporters weren’t flocking to cover the rallies or tell the story, but then, in late June, something shifted. In her little yellow house on the south side of Flint, Lee Anne Walters opened her laptop, and there, in her email, was a draft report from an EPA guy who had come to her house to check out her tap water. "You know, talking about the 'hazardous waste levels' of lead was certainly attention grabbing." She immediately forwarded the email to a reporter she had met in the spring. Curt Guyette is an investigative reporter who works for the ACLU of Michigan. “You know, talking about the ‘hazardous waste levels’ of lead was certainly attention grabbing,” says Guyette. The draft EPA report showed lead levels at Lee Anne Walters’ house were way worse than she thought. We’re talking simply jaw-dropping numbers. Let me put it this way: If you have a glass of water, and it has a lead level of 5,000 parts per billion, the EPA considers it hazardous waste. One sample from the Walters’ house had more than 13,000 parts per billion. And that’s not even the scary part. The scary part is this report said there was reason to believe that the Walters’ home could be a canary in the coal mine. “It’s not this individual home. It’s not coming from inside the home. It’s coming from outside the home," Guyette said. We know now, from emails and other records, that, for months, the EPA had been warning state officials that something was wrong with Flint’s water. But you won’t hear from the guy who works for the EPA who wrote this report; the guy who was doing most of the warning. The EPA won’t make him available, but Guyette managed to get him on the phone before writing a blog post about the report. This leaked report, this was the very first time any official had publicly said Flint’s water may not be safe. But back then, the EPA report wasn’t finalized, so Guyette was lucky to have scored this one conversation with the author. The EPA wasn’t talking to any reporters about it. So back in July, I turned to Brad Wurfel, the spokesman for Michigan’s Department of Environmental Quality. Wurfel agreed to talk to me about the EPA report. The first thing I asked him was: what responsibility does the state have in making sure lead isn’t getting into people’s drinking water? "Let me start here. Anyone who is concerned about lead in the drinking water in Flint can relax." It turns out, there was a broad problem, and it turns out, the MDEQ is exactly the agency responsible. 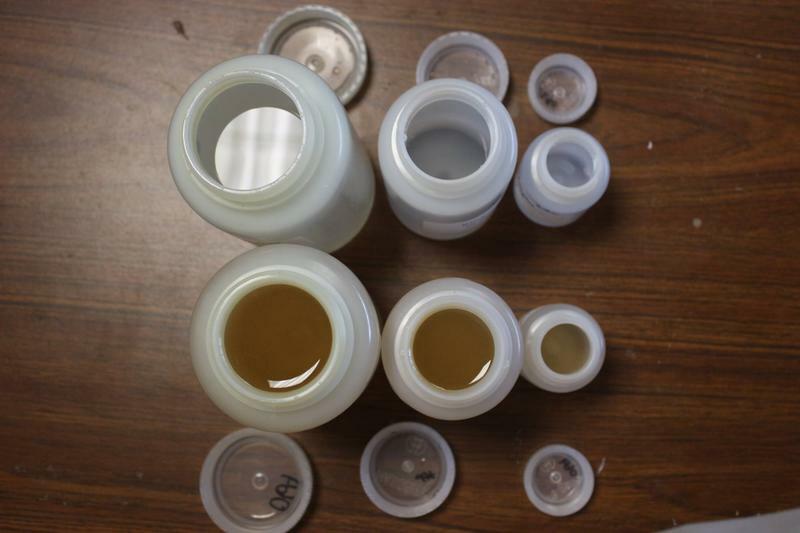 And we know now that the same week I talked to Brad Wurfel, was the same week some of the people he works with at the MDEQ realized that Flint’s latest lead tests weren’t looking too good. About a month after the EPA’s report was plastered all over the media, Lee Anne Walters went with a group of Flint residents and concerned pastors to Lansing. They were able to arrange a meeting with top officials at Michigan’s Department of Environmental Quality. Walters had hoped that, after she leaked the federal report, state officials would take their concerns more seriously. “They blew us off like we didn't know what we were talking about,” says Walters. State officials told Walters and others that the EPA employee who gave her the report had been “handled,” but Walters had met someone who did take her seriously. 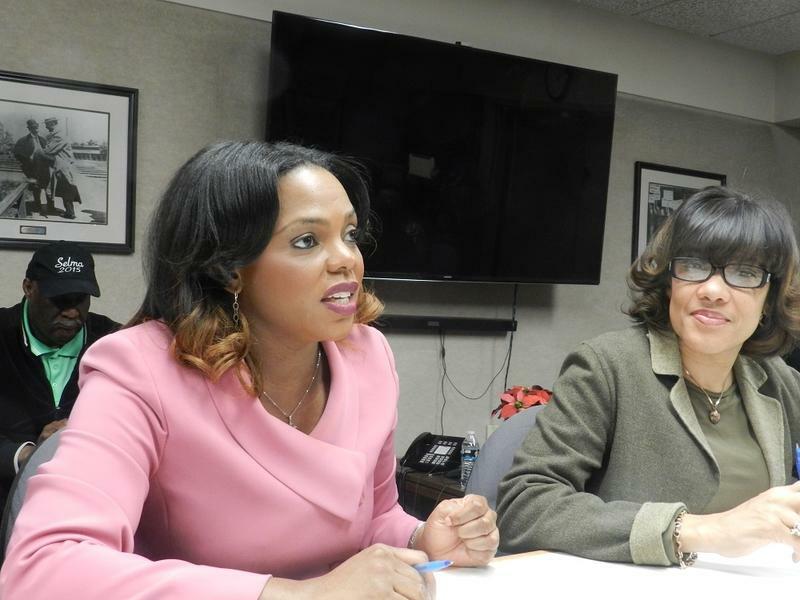 Later that afternoon, after that unproductive meeting with state regulators, she made a phone call that helped change the course of Flint’s water crisis. Marc Edwards is an environmental engineer, and a professor at Virginia Tech. He’s studied the corrosion of old water systems for decades. Edwards has tested probably 30,000 homes for lead in his career. 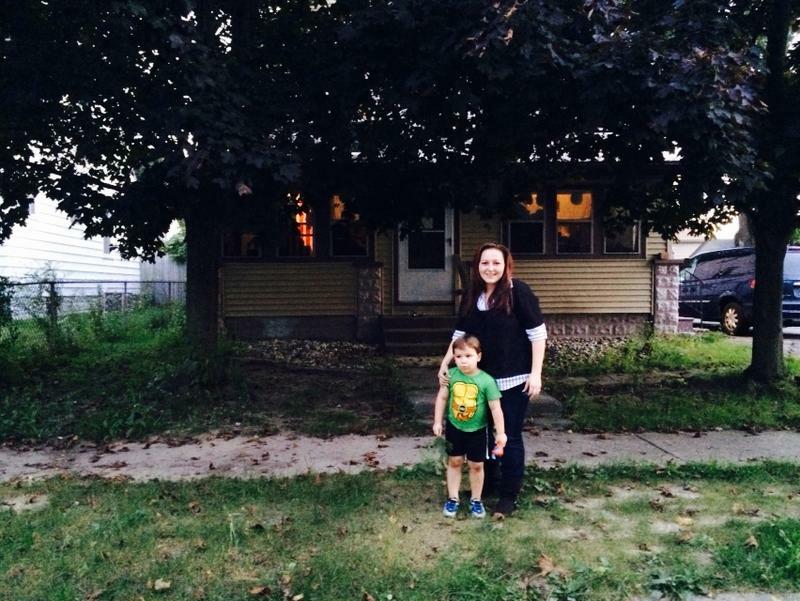 He’s never seen anyone with higher lead levels than Lee Anne Walters’ home in Flint. Virginia Tech's Marc Edwards said he was angry after hearing how state officials treated people in Flint. On that warm, Tuesday afternoon in August, when Walters called Edwards to tell him how awful that meeting with the state went, Edwards remembers hanging up the phone and physically shaking with anger. “I mean this is an imminent and substantial endangerment to children, and for me sitting 15 hours away, I can't believe how people could just sit there and let other children drink that water,” says Edwards. Edwards couldn’t sleep. He decided he had to drop everything. He got four grad students together, and a bunch of lead test kits. Two days later, they loaded up in Edwards’ 13-year-old white “soccer mom” mini-van and drove 15 hours straight – directly to Flint. 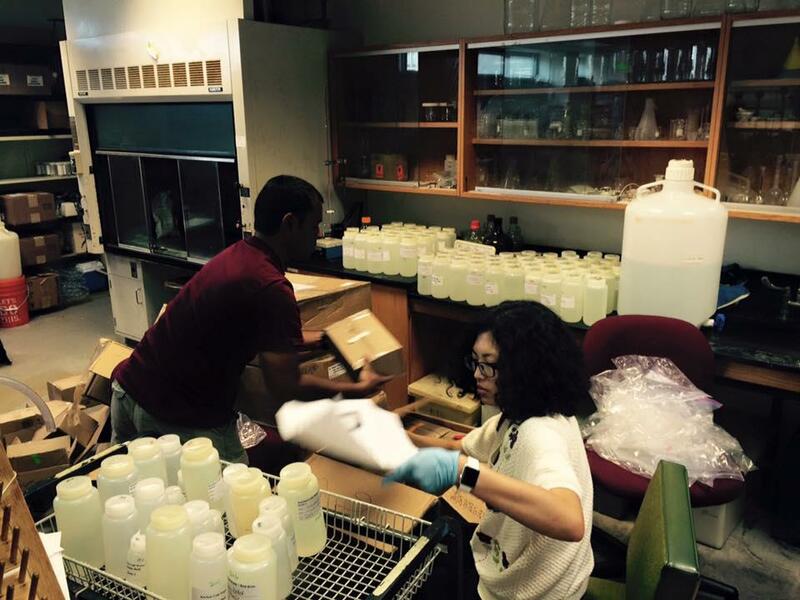 Students in the research lab at Virginia Tech prepare to test water samples from Flint. By mid-August, the small research lab on the 4th floor of Durham Hall at Virginia Tech was a beehive of activity. Cardboard FedEx boxes full of lead testing kits from Flint started arriving for analysis. Lee Anne Walters, and a group of Flint residents helped hand out the testing kits all over Flint. In all, graduate students, like Anurag Mantha processed more than 800 samples. “We spent so many weekends here trying to get that done on time, so that we could get the data and start giving out the results to people because every hour, every day, we're delayed that thing, more and more people were still drinking the Flint water,” she says. The tests showed lead levels in Flint were pretty bad. Bad enough, that one afternoon in mid-September, he went back to Flint. On the lawn in front of Flint City Hall, Edwards addressed several reporters, and about two dozen Flint residents. Point by point, he explained why there’s a dangerous lead problem in Flint. Marc Edwards alerts the people of Flint that they should take precautions when dealing with drinking water in Flint. He held up two small bottles of water. In one with pretty clear water, you can see a small nail in the top. The water in the other bottle is orange. 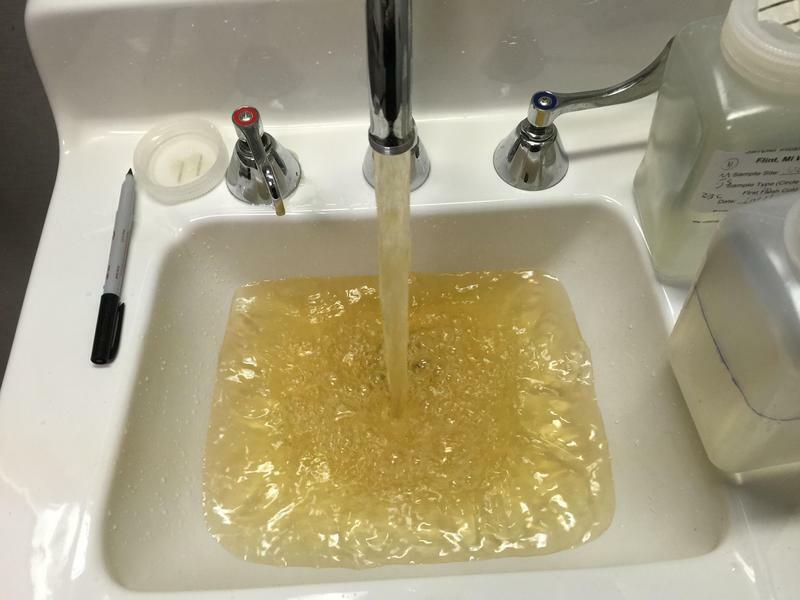 This was Flint’s water. It was basically eating the nail. The iron nail was disintegrating into the water. Edwards says Flint’s corrosive water is doing the same thing to distribution pipes all over the city. But, Edwards warned the crowd, the real danger isn’t the iron you can see in the tap water. The real danger is odorless, tasteless lead, that’s also leaching from the distribution system. 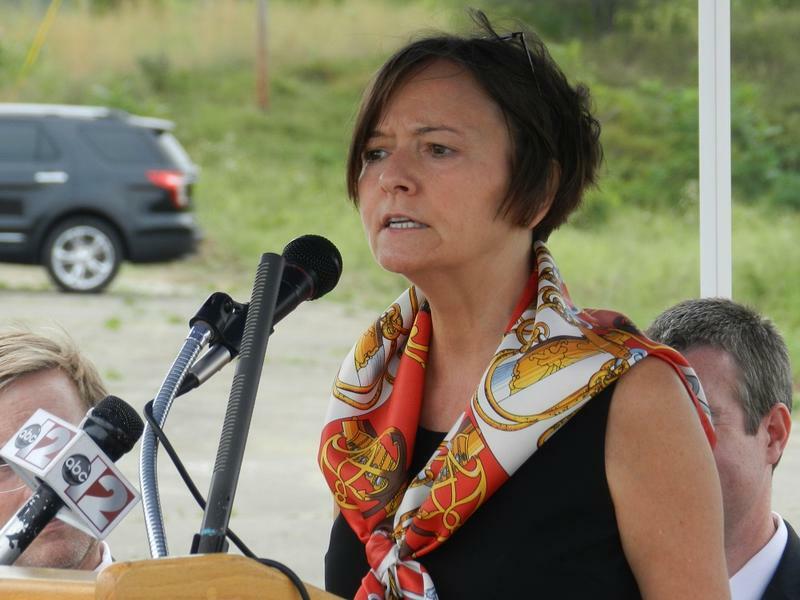 Edwards said people in Flint should protect themselves against the lead exposure immediately. He told them to stop drinking the tap water; to buy a certified lead filter, or bottled water if they can afford it. Click here for part three of Not Safe to Drink, where you can learn how state officials continued to downplay the lead risk to Flint’s children, even after experts found dangerously high levels of lead in the water. And we meet a Flint pediatrician who risked her reputation to change the city’s course. State's instructions for sampling drinking water for lead "not best practice"
The Flint water crisis has uncovered all kinds of details about how cities test the safety of their drinking water. In particular, critics say the state is giving bad advice on testing drinking water for lead. The state of Michigan tells cities to do something called pre-flushing. The city of Flint is taking new steps to reduce lead in the city’s drinking water. Flint is adding phosphates to water it gets from Detroit. Detroit already adds phosphates to the water to make it less corrosive to pipes. Flint Utilities Administrator Mike Glasgow says adding more phosphates to the water should help create a biofilm within the city’s water pipes. “That should help alleviate our lead issues out in the system,” says Glasgow. 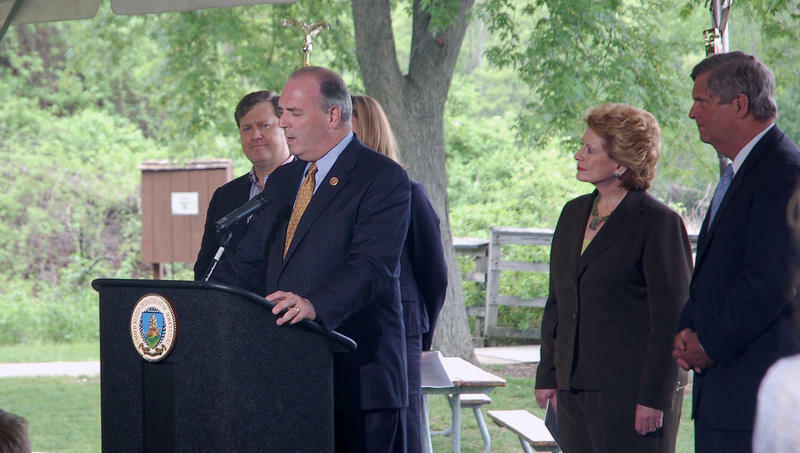 Democratic U.S. Rep. Dan Kildee of Michigan tells Cynthia Canty about how he is working on a way for the federal government to help Flint following the lead water crisis of 2015. Kildee is trying to get Michigan and the federal government on the same page about a loan forgiveness program that could result in $22 million for fiscally strapped Flint. Kildee also explains his vote on a new visa program and expounds on the dangers of Republican presidential candidate Donald Trump's statements about Muslims.